In addition to their often attractive illustrations, bestiaries are appealing because--with their combination of real and misunderstood facts, fantasy, and religious interpretation--they seem to offer us a window into the medieval person's view of the natural world. They have traditionally described by scholars in terms of being natural history books, but recent research has shown that from the 12th century onwards the bestiary was used largely as a source of theological inspiration for sermons, rather than for information about animals. This copy is related to other manuscripts which may have been made in Salisbury. 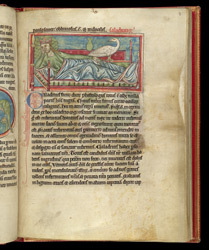 It was believed that the caladrius could be found in royal residences, and could tell if a sick person would live or die: if it turned its back on the person they would die, but in this miniature the bird looks at the king, who could therefore be expected to recover.